The CPC7701 is a low charge injection 16-channel high-voltage analog switch integrated circuit (IC) for use in applications requiring high voltage switching. Bleed resistors are incorporated into both terminals of each output switch. Control of the high voltage switching is via low voltage CMOS logic level inputs for direct connectivity to the system controller. 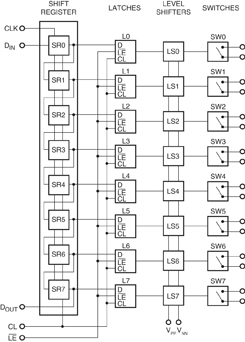 Switch manipulation is managed by a 16-bit serial to parallel shift register whose outputs are buffered and stored by a 16-bit transparent latch. Level shifters buffer the latch outputs, and operate the high voltage switches. Because the CPC7701 is capable of switching high load voltages and has a flexible load voltage range, e.g. VPP/VNN: +40V/160V or +100V/100V, it is well suited for many medical and industrial applications such as medical ultrasound imaging, printers, and industrial measurement equipment. The bleed resistors enable the discharge of capacitive loads, such as piezoelectric transducers, connected to the output switches of the CPC7701. Construction of the high voltage switches using IXYS Integrated Circuits Division's reliable SOI BCDMOS process technology enables the switches to be organized as solid state switches with direct gate drive. Available in the 48-pin LQFP package. The CPC7601 is a low charge injection 16-channel high-voltage analog switch integrated circuit (IC) for use in applications requiring high voltage switching. 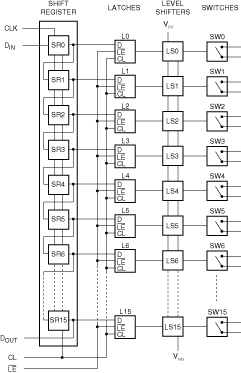 Control of the high voltage switching is via low voltage CMOS logic level inputs for direct connectivity to the system controller. Because the CPC7601 is capable of switching high load voltages and has a flexible load voltage range, e.g. VPP/VNN: +40V/-160V or +100V/-100V, it is well suited for many medical and industrial applications such as medical ultrasound imaging, printers, and industrial measurement equipment. Construction of the high voltage switches using our reliable SOI BCDMOS process technology enables the switches to be organized as solid state switches with direct gate drive. The CPC7232 is a low charge injection 8-channel high-voltage analog switch integrated circuit (IC) for use in applications requiring high voltage switching. Bleed resistors are incorporated into both terminals of each output switch. Control of the high voltage switching is via low voltage TTL logic level compatible inputs for direct connectivity to the system controller. 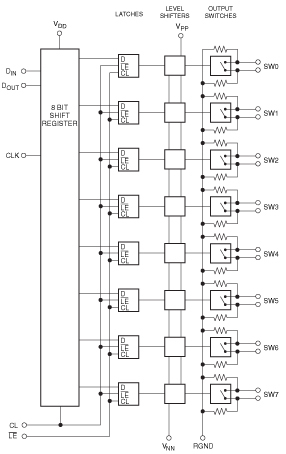 Switch manipulation is managed by an 8-bit serial to parallel shift register whose outputs are buffered and stored by an 8-bit transparent latch. Level shifters buffer the latch outputs and operate the high voltage switches. Because the CPC7232 is capable of switching high load voltages and has a flexible load voltage range, e.g. VPP/VNN: +40V/160V or +100V/100V, it is well suited for many medical and industrial applications such as medical ultrasound imaging, printers, and industrial measurement equipment. The bleed resistors enable the discharge of capacitive loads such as piezoelectric transducers connected to the output switches of the CPC7232. Construction of the high voltage switches using our reliable BCDMOS process technology on SOI (Silicon On Insulator) allow the switches to be organized as solid state switches with direct gate drive. The CPC7220 is a low charge injection, 8-channel, high-voltage analog switch integrated circuit (IC) for use in applications requiring high voltage switching. Control of the high voltage switching is via low voltage TTL logic level compatible inputs for direct connectivity to the system controller. 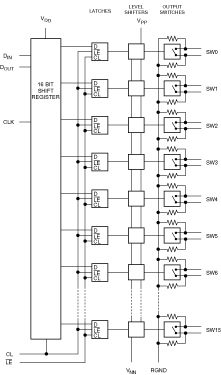 Switch manipulation is managed by an 8-bit serial to parallel shift register whose outputs are buffered and stored by an 8-bit transparent latch. Level shifters buffer the latch outputs and operate the high voltage switches. Because the CPC7220 is capable of switching high load voltages and has a flexible load voltage range, e.g. VPP/VNN : +40V/-160V or +100V/-100V, it is well suited for many medical and industrial applications such as medical ultrasound imaging, printers, and industrial measurement equipment.